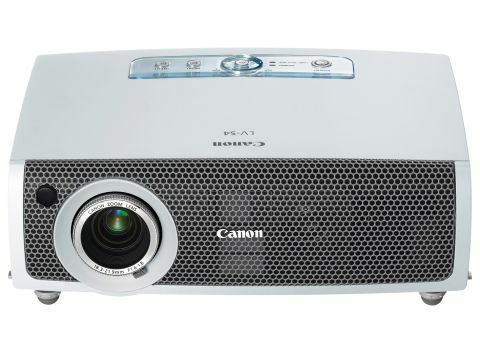 Canon is aiming the LV-S4 at the education market, where cost and compatibility with a range of older computers is essential. Therefore, what we find are standard connections and a clear amount of labelling. The LCD machine offers a surprisingly high 1500 ANSI lumens, which is bright enough for any room. Let's not beat about the bush, the LV-S4 is far too noisy at 38.5dB in normal mode, and we think its stretching things a bit to say that 33dB rates as 'ultra-quiet' in Eco-mode. Although the contrast ratio is low, the LCD display gives an accurate representation of a laptop display and is very warm on the eye. However, the 800 x 600-pixel resolution is a distinct limit. On a positive note, the LCD technology means that you don't get the jet of exhaust heat out of the front that we have noted on DLP models in the past. Canon provides composite, VGA and audio mini jack inputs, plus VGA pass through and audio output, but you only get a VGA cable and power cord in the box. Someone hasn't thought about the ergonomics of this model, as the focus and zoom controls are in the lens housing and are a bit fiddly to operate, while the set-up menu is quite horrible. It is arranged in an L shape that borders the picture and is terribly confusing. You are advised to use the remote control wherever possible to make changes to your settings.